The penultimate weekend of the 2017 MLS regular season produced strong moves for teams such as Seattle, Columbus, Portland, Houston and Chicago, and a steep drop for Sporting Kansas City. Crew SC ran its winning streak to three games by beating Orlando City, 1-0, and Houston took four of six points in a pair of games with SKC. Powerful 4-0 wins for Seattle (against FC Dallas) and Portland (D.C. United) secured their playoff slots. The regular season concludes Sunday with a full slate of 11 games kicking off simultaneously at 4 p.m. Eastern. 1. TORONTO FC (20-5-8-), 1. Here are the numbers: TFC tied the league record of 68 points set by the Galaxy in 1998, Jozy Altidore bagged his 16 goal of the season, and keeper Alex Bono notched his 10th shutout. Nicolas Hasler started a third straight game at right wingback; has he taken the job from Steven Beitashour? 2. ATLANTA UNITED (15-9-9), 2. Flying under the radar is the fact AUFC is one of the league’s stingiest teams since early September. In the last seven games it has pitched seven shutouts (conceded five goals in the other two games). Josef Martinez started and somehow played 77 minutes without taking a shot. 3. VANCOUVER (15-11-7), 4. The ‘Caps were unable to protect a 1-0 lead supplied by Yordy Reyna’s sixth goal of the season and still need at least a point in their season finale to avoid the Knockout Round. 4. SEATTLE (13-9-11), 7. Two goals in three minutes by Will Bruin broke open a 1-0 game as the Sounders maintained their perfect record of playoff qualification in every season since joining MLS in 2009. 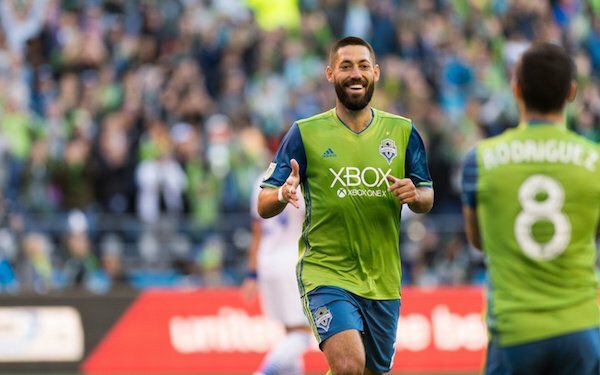 Clint Dempsey played the full 90 minutes, landed two of five shots on goal, and earned an assist on the opening goal by Victor Rodriguez. Seattle broke out of a scoring slump – six goals in the previous seven games -- but got only its second win in that span. 5. COLUMBUS (16-12-5), 8. Scorer of 16 goals last season, his first foray into MLS, Ola Kamara went one better with his 17th, albeit with a lot more minutes played (2777 as compared to 1859). Wil Trapp secured the defensive half of the field with three tackles, three interceptions and four clearances. Crew SC is unbeaten in its last nine games and looking like a tough out in the playoff round. 6. PORTLAND (14-11-8), 9. One more goal and two more assists for Diego Valeri upped his totals for the season to 21 and 11, respectively, enabling him to join Sebastian Giovinco as the only 20-10 men in league history. Sebastian Blanco scored the last two goals and with eight on the season along with seven assists (in 31 games) will be a key figure in the playoffs. 7. HOUSTON (12-10-11), 10. The team that had lost three of four as of last month to put its playoff hopes in doubt maintained its revival by claiming four points and securing a postseason slot. It rallied to beat SKC with a strike by Tomas Martinez and an own goal, then rode a nine-save game by Tyler Deric to clinch a slot. Kudos to head coach Wilmer Cabrera for a dramatic transformation. 8. CHICAGO (16-10-7), 12. Okay, seven points in the last three games in more like it, as is a Nemanja Nikolic hat trick, one of more of which ties him for the seasonal record of 27 goals. Also good is improved health for David Accam and Bastian Schweinsteiger, who both made appearances off the bench. 9. NEW YORK CITY FC (16-9-8), 5. A red card to Jack Harrison in the 26th minute enraged head coach Patrick Vieira and a sputtering attack didn’t score until Khiry Shelton netted in stoppage time. In its last six games NYCFC has won only once. 10. SPORTING KC (12-8-13), 3. The goals have dried up. SKC has been blanked in its last two home games and in a four-game winless run has scored only two goals. But with 27 shots in the shutout, including 10 by Benny Feilhaber, it has only itself to blame. 11. REAL SALT LAKE (12-15-6), 6. Sometimes nothing a team can do can produce a goal. RSL outshot the Rapids, 29-2, and controlled 72 percent of possession to no avail. Despite the desperate need for a goal, head coach Mike Petke left Yura Movsisyan on the bench. RSL needs to beat SKC at home and get some help to sneak into the playoffs. 12. SAN JOSE (12-14-7), 15. Designated Players must come through in crucial times and that is what Vako and Chris Wondolowski did in the 77th minute. Vako scored his fifth goal in 12 games when put through by a clever Wondo backheel. The Quakes clinch their first playoff spot since 2012 if they beat Minnesota United at home Sunday. 13. MINNESOTA UNITED (10-17-6), 11. The Loons fell back to earth after earning 10 points in their previous four games yet have already guaranteed they won’t finish in last place. 14. NY RED BULLS (13-12-8), 13. The Kings of Ambiguity did it again, blanking a high-scoring team while failing to score at home. Gonzalo Veron has bagged four of his five 2017 goals off the bench and in 20 minutes of action landed two of three shots on target. 15. NEW ENGLAND (12-15-6), 19. Two goals by Diego Fagundez ended a personal scoring drought of more than four months and earned the Revs their second victory in the last four games. They end up with a 12-2-3 home record and are winless on the road heading into the season finale at Montreal. 16. FC DALLAS (10-10-13), 14. FCD matched Seattle in shots (14-14) and connected on 85 percent of its passes while tumbling to its seventh loss in the last 14 games to lose control of its playoff destiny. 17. COLORADO (9-18-6), 20. Keeper Tim Howard turned back the clock to deny RSL; several of his seven saves were top-class. A clever redirection by Alan Gordon set up Josh Gatt to score in the third minute. But a grand total of two shots and 28 percent possession? Come on. 18. L.A. GALAXY (8-17-8), 22. Courtesy of VAR, Jonathan Dos Santos scored his first Galaxy goal in between a pair of tallies by Romain Alessandrini, who in a shipwreck of a debut season has racked up 13 goals and 11 assists. Baggio Husidic ended a 4½-month injury layoff by playing the last 14 minutes. 19. PHILADELPHIA (10-14-9), 16. Philly battled and got a go-ahead goal from Alejandro Bedoya in the 13th minute but could not contain the Fire and Nikolic down the stretch. A foul by Jack Elliott on David Accam gave Chicago its opportunity to equalize from the penalty spot. 20. ORLANDO CITY (10-14-9), 17. A third shutout in the last four games dropped the Lions’ final home record to 7-5-5, a sharp drop for a team that won its first five home games of the season. Kaka said farewell to the home fans with a 90-minute performance that included three shots and one key pass. 21. D.C. UNITED (9-19-5), 18. United labored through its second straight shutout even though it put five of its seven shots on goal. It has lost four of its last six games; Homegrown defender Jalen Robinson started his second consecutive game and fifth of 2017. 22. MONTREAL (11-16-6), 21. The Impact fell to its eighth loss in the last nine games despite putting more shots on goal, 5-3, than the league’s best team.